Retrofit replacement for fluorescent tubes T8 / T10 - 90 cm, 30 Watt, twist/fixable base G13, the tube can be optimally aligned. 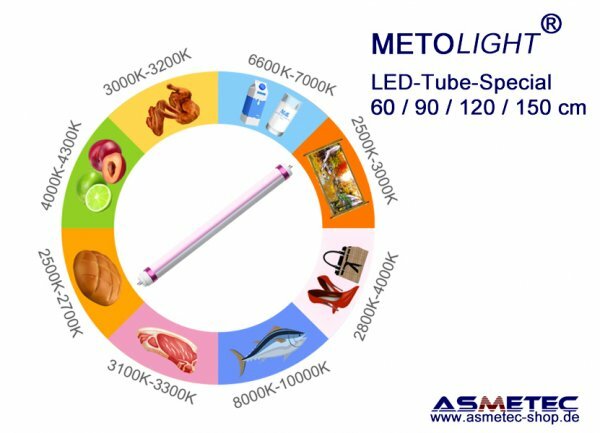 The METOLIGHT LED tube of the MEAT series is significantly brighter than a conventional fluorescent tube 90 cm / 30 Watt - T8 - saves more than 50% energy with a shelf life about 10 times longer. The matt cover provides glare-free light at a light angle of approx. 120°-140°. This series of LED tubes has been specially developed to display the meat on display in meat counters in its natural colours. 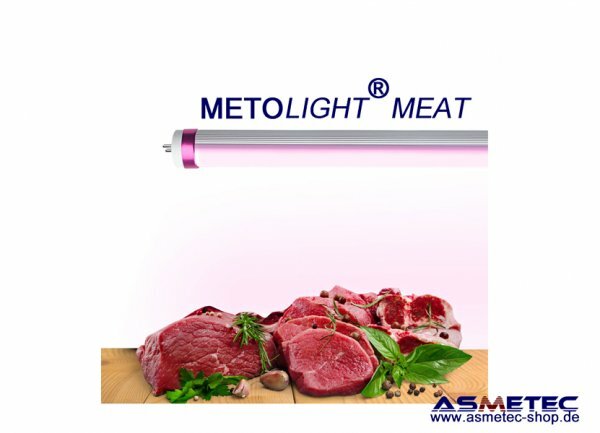 We supply the LED tube MEAT-series in different pink colours, optimized for the respective meat types. In the MEAT-P version, the light is generated by special coated LEDs, with a pink touch for meat such as pork appearing in its natural colours. Why should special LED tubes be used in meat counters? Health conscious consumers have been purchasing increasing amounts of poultry in recent years, raising awareness of food safety and harmful bacteria such as Salmonella, and demanding high quality meat. Poultry display lighting that emits UV raises surface temperatures of meat packages, providing an ideal environment for bacterial growth. 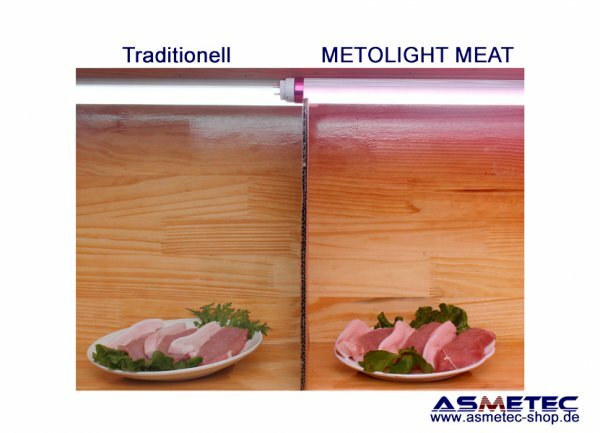 METOLIGHT Safe Spectrum balanced full spectrum lamps and LEDs emit lower levels of heat and ultraviolet radiation than regular supermarket fluorescent lamps, thus reducing the rate of poultry decomposition. However, different light sources affect the perceived color of the poultry because they have different spectral components, so the same chicken part can appears to be several different colors. For example, a panel described a chicken leg as pink or red when it was under an incandescent light, brown when under a fluorescent light, and brown to purple under a metal halide light. Since many studies have found that color is one of the fundamental factors consumers consider when purchasing chicken and turkey, it is vital that the poultry be displayed in lighting that does not hide its fresh appearance. TR type is with a little pink which can keep the real color of poultry, as well as prolong its freshness. A rewiring of the lamp or even removing the existing magnetic ballasts is not necessary. The METOLIGHT-MEAT also operates directly on 230 V AC on all conventional magnetic ballasts. All you have to do is replace the supplied LED starter (item 101495). In the case of luminaires with electronic ballast, however, this must be removed by the electrician and the luminaire must be rewired. For this we offer our adapter clamp Art.101606, with which the conversion is possible quickly and professionally. Epistar high efficiency SMD-LEDs with 120 lm/W, CRI Ra> 80, 26 mm - T8 diameter, rotable/fixable socket G13, special aluminium core PCB for best heat dissipation and long life, double insulated internal power supply, short-circuit protection, double insulated internal wiring. Stable aluminium cooling profile, extra light, unbreakable construction, very resistant to radiation. Insulation voltage proof > 3000 volts, high dielectric strength, no flickering due to voltage fluctuations. This LED tube is not dimmable. Use instead of conventional fluorescent tubes in corresponding luminaires with conventional ballast and starter. Particularly suitable for lighting in the food industry, meat counters, freezers etc. The existing starter must be replaced with the supplied LED fuse-starter (Asmetec article no. 101495). Please ask for our current project price.